Just a little programming note. Shades is experimenting with linked footnotes. Select the number in the body of the article and it will take you to the corresponding footnote. Once you've read the footnote, select the footnote number to return to the exact spot you left in the article. —have been a fascinating tool to unearth new layers and stories." As family genealogists are wont to do, a few months ago, I met with my cousin to borrow some wonderful family heirloom documents for scanning. I noticed some older portrait photos in a collage frame on her bookcase and asked “who’s that?” She responded that they were our great grandparents, so needless to say I borrowed those as well. The photos were of my maternal grandmother’s parents, Mary “Mamie” Gertrude Maines and John S. Heinz who married April 30, 1894. 1 John looks quite neat and trim with a surprising resemblance to my brother, but his story, though interesting, is not the story to be told here. 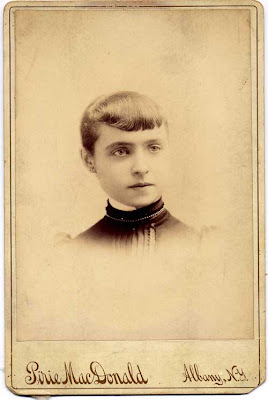 The photo of Mary shows an innocent, wistful and dainty young woman who as life took its course had a connection to two famous men. Once at home, I removed the photos from the frame to discover they were cabinet cards with the photographer’s name noted on front and the studio address on the verso. Ah, a clue to determine the age of the photo! I thought how would the footnoteMaven handle this search? I pictured her reaching for a source in her ample photographic library. Alas, I don’t have that, so I turned to the universal library—Google. Pirie MacDonald’s story started in Chicago where he was born Jan 27, 1867 just nine days after his Scottish mother arrived in the US. 4 Sources list his given name as Ian Pirie, but I came to question that since the 1870 census clearly shows him at the age of 3 listed as Jno for Jonathan or John. 5 Years later, in some directories, he is listed as J. P. in his ads. 6 Formal education ended for him at the age of 11. He was self-educated through “constant reading and studying, plus a passion for travel”. He went on to develop lighting techniques that brought a sense of drama to his head and shoulder portraits shot in soft focus. 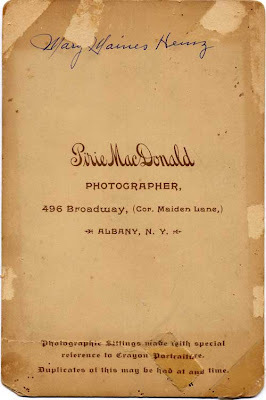 “Perhaps MacDonald's greatest genius was in his use of lighting to create a certain glisten and gleam that made his portraits so notably rich.” His portraits were centered on the face, showed little of the body, and made no use of backdrops, furniture, or studio props; only on rare occasions were some occupational prop included. 12 In a matter of a few years, he “quickly won acclaim for his camera studies of women.” 13 While still in Albany, his fame grew such that his work won awards at exhibits in New York, the Midwest, as well as Paris. 14 Even so, he found time to contribute to the Albany community, such as being a judge for an 1895 high school drawing competition. 15 Later, he would be a prestigious judge at many important photographic competitions. Alas, his talents outgrew his adopted city. In an April 1900 photography periodical, his business card was shown announcing a New York City studio he had established. 17 By mid November of that year, the Albany paper had a notice that Pirie would now be devoting his time to this New York City location. The Albany studio would close December 1. 18 In the spring of 1901, another notice appeared in the Albany paper to announce that all negatives from the Albany studio would be turned over to the Gustave Lorey studio. The notice goes on to recommend Mr. Lorey as “an accomplished artist” who “has an unquestionable reputation for integrity, and Mr. MacDonald bespeaks for him the favor of his former clients.” 19 Coincidently, that studio was where my own first baby pictures were taken. Perhaps the negative of my great grandmother’s portrait was still sitting on a dusty shelf somewhere in a back room as I posed. Take note that he has now chosen to specialize only in creating portraits of men. So the already precious photo of my great grandmother is now even more dear due to the scarcity of Pirie MacDonald female photos. One of his personal favorites was his portrait of Theodore “Teddy” Roosevelt. That same portrait was Teddy’s wife’s favorite as well. During Teddy’s reign as governor of New York in 1899-1900, Pirie photographed Teddy’s children and their pets in Albany as well as at their Oyster Bay estate. Once Teddy reached the White House, he extended an invitation to Pirie to come there to do his portrait. Pirie declined and the President had to come to him. 26 Now that’s power and prestige! And as the noted photographer rose to fame, what became of Mary Maines Heinz? She became a mother of a brood of eight. Her eldest daughter, Gertrude Mary Heinz, was my grandmother who married Henry Donald McMahon. This marriage brought a tie to another of Pirie MacDonald’s subjects. As a young boy, Henry’s family lived in the shadow of the Governor’s Mansion in Albany. So close that if he sat on his stoop, he could look up the block towards the driveway of the Mansion to see then Governor Teddy Roosevelt and family coming and going. So close that one of those pet dogs of the Roosevelt family captured in Pirie MacDonald photos was able to wander down the street to pay a visit to Henry’s mother’s garden and tear it up. I can just picture his Irish born mother, Margaret O’Donnell McMahon, marching up the street to the Mansion door with apron strings flying and children in tow to demand restitution. In fact, she did receive it because Teddy’s gardener was sent to do the repairs. Perhaps, somewhere there still exists a Roosevelt family photo of the culprit pet that had a brush with my family. 5. 1870 U.S. census, Cook County, Illinois population schedule, Ward 5 Chicago, p.249 (penned), p. 279 (stamped), dwelling 1703, family 1935. Jno. P. MacDonald: digital images, Ancestry.com (http://ancestry.com); from National Archives microfilm publication M593, roll 200. 24. “Pirie M’Donald Dead at Age of 75,” New York Times (New York), 23 April, p.23; digital images, ProQuest Historical Newspapers The New York Times 1851-2005 (access through participating libraries). 30. “Want Photographs to Last Forever,” New York Times (New York), 13 November, 1912, p.22; digital images, ProQuest Historical Newspapers The New York Times 1851-2005 (access through participating libraries). A wonderful piece - and a great job with your source citations and footnotes that actually jump down to the text! This is great! And yes, I too love the footnotes! Cite, cite! Wonderful article and I love the footnotes as well! Cite cite cite! I love the way the author wove the story together from her family's photo to the photographer and his life and back to her family even citing a connection to TR. Masterful, clear, well documented and fun to read! 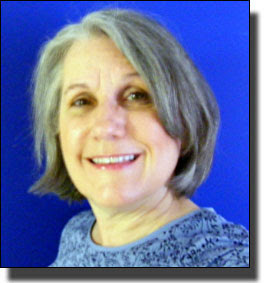 Cudos to author Donna McClure!